As I was driving in to work recently, I followed a pickup truck whose tailgate was filled with what I call, “bumper sticker commentary”(BSC). The owner was clearly trying to be provocative by the extreme messages that were communicated on her tailgate. 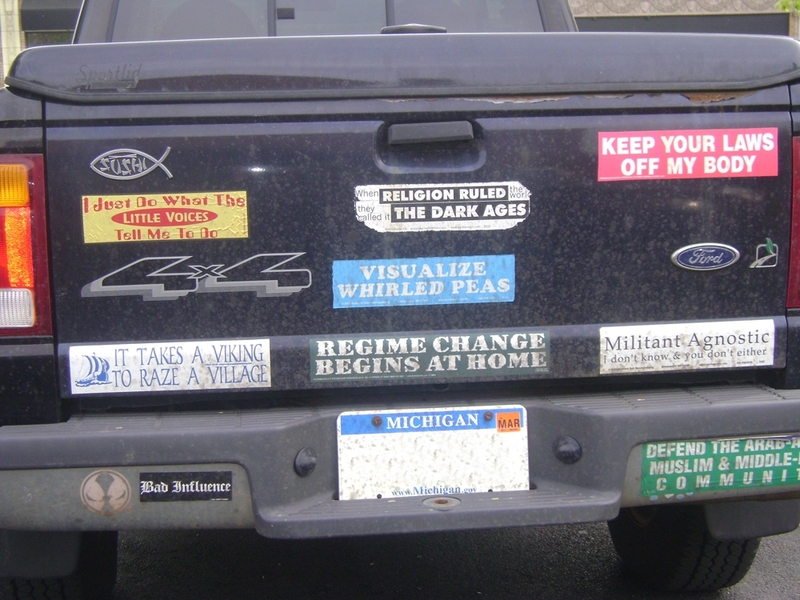 Here are a few examples: “Keep your Laws off my Body,” “Religion Ruled the Dark Ages,” “Bad Influence,” “Militant Agnostic (I don’t know & You don’t either),” ”It takes a Viking to Raze a Village,” “Visualize Whirled Peas,” and in the upper left corner of the tail gate the classic Christian fish symbol with “Sushi” written inside of it. The Lord chose to have me follow her all the way into work that day, so I turned off the radio and reflected on each bumper sticker at least two or three times during that twenty five minute ride. My thoughts ranged from ‘who in their right mind would put all those bumper stickers on their otherwise pretty nice looking Ford Ranger Pickup?’, to ‘what has caused her to become so public with her opinions?’ I wondered what she would do and say if we had an encounter? How would I respond? I was actually wondering, does she really view Christians as “Sushi”? I have never been defined that way before and I wondered what has made this person so angry at Christians? Others throughout history have been very angry at and blood thirsty for Christian blood, forcing believers to communicate through symbols. For many years following the ascension and the resurrection of Jesus to heaven, the Christian church grew rapidly. Those who claimed to be Christians became subjects of persecution by both the Romans and the Jews. In many locales, it became dangerous to be known as a Christian. During that time period, when two people met and thought maybe they were fellow believers, one of them would draw on the ground the upper half of the fish symbol. Recognizing the symbol, the stranger would add a second curved line and complete the drawing of a fish. It is a very simple shape to draw – just two curved strokes. It could be drawn quickly, and erased just as quickly if there was no sign of recognition on the part of the stranger. This symbol, and all of its rich heritage has been under attack and is still under attack. Jesus Himself continues to be a point of contention and attack as well. But what struck my heart was the intensity of that tailgate and the state of mind of the owner. It did not matter to me any longer that she viewed me as “Sushi,” however she defined that. There have been many who have gone before me who were viewed the same or worse, and they did not waver, even to the point of death. The Lord reminded me of Mark 1:17, “Come, follow me…and I will make you fishers of men.” What was in front of me for those twenty five minutes was the reason Jesus died on the cross. I was being challenged to move from a place of being insulted to a place of being willing to reach out to this person, to hear her story and then communicate to her the good news of the gospel. The Lord wanted me to live out that symbol and begin fishing for those in her pond, or more realistically in our day – her ocean. Thanks for your good post, Kurt, and for perceiving what may be a heart-cry in the implied subtext beneath this bumper sticker commentary. May the Lord grant you an opportunity to listen with love to this driver who desperately needs the life-transforming gospel of Jesus so she can know, believe, love, and worship the true and living God (Col 4:5-6).